For many college students, the growing global migrant crisis may seem a tragic but distant reality. But for 20 Emory students, the challenges faced by the world’s displaced peoples took on real-life dimensions this semester through an anthropology special topics seminar that found them working together with migrants and refugees across four continents. The class, Anthropology 385: The Migrant and Refugee Crisis, nurtured an intimate, first-person understanding of issues migrants face by requiring students to talk with these people, understand their lives and needs, and propose sustainable solutions to address some of their barriers to success. The course is taught by Isabella Alexander 16PhD, a cultural anthropologist and assistant visiting professor in the Department of Anthropology whose research focuses on the socio-political realities of transitional migration in some of the world’s most critical border regions. In the classroom, the search for understanding meant skyping and talking with displaced migrants and refugees originally from countries such as Syria, Guinea and Afghanistan to capture unfiltered views on issues including access to health care, education and legal assistance, labor and human rights abuses, and employment discrimination. “It’s not just about identifying and understanding the problems in our world, it’s creating solutions to them,” Alexander explains. 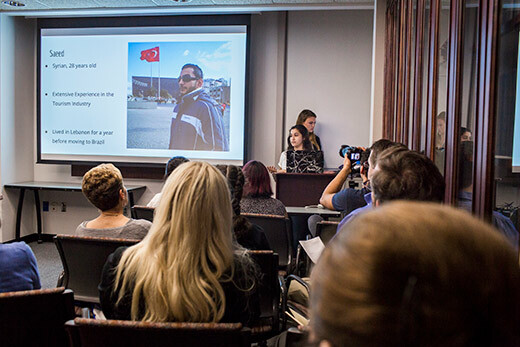 That’s how Emory students found themselves in a campus conference room last week presenting enthusiastic pitches to educators and community organizers about the apps, online platforms and resources, and community programs they created in hopes of garnering both interest and support. Instead of churning out final papers, their culminating project involves writing targeted grant proposals that could help bring it all to life. To the students, it was a heady experience, steeped in the thrill of identifying a problem and actually doing something about it. For their professor, it was an affirming case study in the power of engaged learning. Though she’s taught the seminar before, it’s the first time Alexander has structured it to include interactions with global community partners — migrants and refugees originally from Colombia, Mexico, Syria, Afghanistan, Guinea and Sierra Leone now living in Morocco, France, Italy, Brazil, Canada, Lebanon and the U.S.
“After my first class, I knew from my own experience working in migrant and refugee communities that there was still a piece missing,” Alexander recalls. Supported by an engaged learning grant from Emory’s Center for Faculty Development and Excellence, the course provided many students with their first deep dive into the topic. For Mikaila Schmitt, a senior majoring in anthropology, the class offered her first real exposure to immigration issues. Teamed with senior Konya Badsa and junior Sophia Dillon, the group connected with Khatera Barati, a 17-year-old North Druid Hills High School student and refugee who was resettled from Afghanistan to the U.S. with her family at the age of 14. Bright and funny, Barati shared frank stories of how difficult it had been to navigate adolescence and a new culture, while searching for connection and support. “When I heard her story, her experiences and struggles coming here as a refugee, I knew that if I was in her shoes, I would want a mentor, a friend, someone to guide me,” says Badsa, a senior majoring in quantitative sciences with a concentration in biological anthropology. Out of those conversations grew “Friendship Beyond Borders,” a peer mentorship program that seeks to connect refugee girls at The Global Village Project in Decatur with non-refugee girls at Atlanta’s The New School to support one another and promote cultural understanding. Even as the Emory students were presenting their “pitch,” the project had momentum. Girls at both schools have enrolled to participate; some have already received training in cultural sensitivity. Mentors and mentees will be paired this month. As the daughter of African immigrants who came to the U.S. from Sierra Leone, Adama Kamara, a sophomore majoring in anthropology and international studies, was especially interested in the class. Her response? Kamara and fellow student Mialovena Exume, a senior majoring in anthropology and human biology and Spanish, worked with Mamadou, a Guinean asylum-seeker now living in France, to create “More Than a Migrant,” an online platform for African migrants to share their stories and report abuses. The goal: Raise public awareness about the world’s largest migrant population while providing human rights advocates with critical first-hand information on the types, locations and frequencies of abuses on a global scale. And just as students grew through the experience, so did their global community partners. Many participated in classroom reading assignments along with their Emory peers, Alexander says. “It was really special for us to forget that we're migrants or refugees for a few hours every week and just get to be college students and normal teenagers again,” says Mamadou. “We didn't know that college students in America knew about us or cared about our lives. This class has made us feel like the world is smaller and our future is a little more hopeful." For Kamara, the experience has prepared her for next semester, when she’ll study migration issues in Geneva, Switzerland. “This class made me see that despite the fact that I’m a black woman coming from a Muslim community, I have this huge privilege of having the resources and a voice that others don’t always have,” she says. A platform for DACA recipients to share their stories, raise public awareness about current U.S. immigration policies and the contributions of undocumented migrants. An online database providing refugees with health literacy and information on low-cost and no-cost clinics and healthcare resources. A legal aid program connecting undocumented migrants in the U.S. with law students seeking to learn more about immigration law and local firms seeking to donate pro-bono hours. An educational program and interactive classroom experience aimed at ending racism against refugee through videos on Syria and Lebanon’s unique history; led by college students in high schools around Lebanon. An app providing undocumented high school students in the U.S. with information on colleges and universities open to them and connecting them to low- and no-cost application resources in their communities. Online marketplace for migrant and refugee artists to sell their work across borders and connect with other artists. Anonymous platform for migrants to report abuses, providing organizations and those fighting for migrants’ rights with critical information on types, locations and frequency of abuses in the U.S.
A step-by-step program providing refugees with financial literacy education and resources necessary to ease their transition over the first year in a new country.